Two significant players in the microgrid industry, S&C Electric and IPERC (Intelligent Power & Energy Research Corporation) today announced that they will merge. Chicago-based S&C, a global provider of equipment and services for electric power systems, is acquiring New York-based IPERC, an industry leader in cybersecure, intelligent microgrid control systems. The companies have signed a definitive agreement under which S&C acquires all outstanding common shares of IPERC. Terms of the transaction were not disclosed. IPERC will operate as a wholly owned subsidiary of S&C reporting to Wanda Reder, chief strategy officer. Also as part of the transaction, Erik Svanholm, currently chief operating officer, will assume the role of CEO of IPERC and will be charged with guiding the future of the business. Darrell Massie, IPERC founder and chief technology officer, will become IPERC’s chief technical officer. This will allow him to focus his time and talents on maintaining IPERC’s position in the marketplace as a technological leader and subject matter expert, according to a news release issued by the companies. The new organizational approach is meant to facilitate continuity and uninterrupted focus on IPERC’s mission to be the leader in providing transformational energy solutions in the areas of control, intelligent power management, cyber security and energy services. 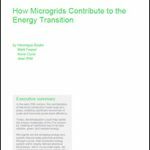 More Microgrid Knowledge stories on S&C Electric and IPERC.